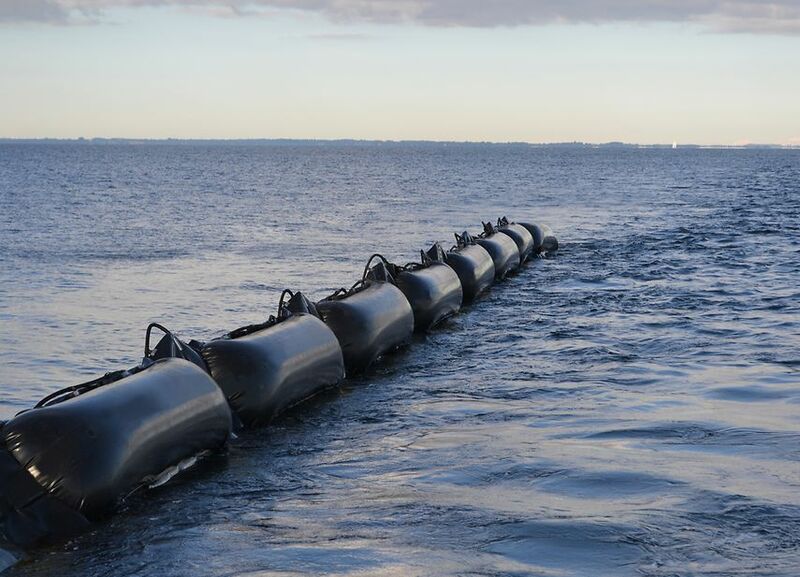 Continental has developed a new generation of floating oil barriers for use on the high seas. With a width of 3200mm, they are especially suitable for use on rough seas. The energy requirements around the world mean an increase in the amount of crude oil transported by sea. This also brings an increase in the risk of accidents entailing considerable impact on the environment as well as on a company’s profitability – both during pumping on the drilling rigs and in the event of maritime disasters involving damage to giant tankers. In collaboration with a partner, Continental has now developed a highly effective protective measure: a new type of floating oil barrier that can withstand even Arctic storms. The barriers are used during regular maintenance for oil drilling rigs as well as in emergency situations because, despite stringent safety measures, accidents on the high seas cannot be completely avoided. Following incidents and accidents, immediate action is essential in order to minimise the extent of the resulting oil slick. The floating barriers surround leaked oil at sea so that tankers can quickly pump it out of the water using hoses. Depending on the swell, this takes place directly at the deployment site or in more moderate waters with smaller waves. The method of surrounding oil in this way is not new, and the floating barriers have also proven themselves for many years in serial use during maintenance work on oil drilling rigs. However, the latest generation of the oil barrier has a special feature to offer. “What makes it so unique is the special width of the air bags: Products commonly found on the market measure no more than 2000mm. For production- and material-related reasons, it was previously not possible to manufacture this product with other dimensions. With our 3200mm wide barriers, we are setting new standards in environmental technology,” said Michael Möschen, an application engineer at Continental. With this development, Continental has succeeded in creating oil barriers that can withstand even heavy fall storms, while conventional designs with a width of just 2000mm are quickly washed over in heavy swell – with catastrophic consequences for the environment. The latest generation of the oil barrier is made, assembled and vulcanised at the Continental plant in Northeim. Like the conveyor belts, the manufacture of which has been a specialism of Continental for decades, it is made from rubber and various fabric layers. There is simply no alternative fabric on the market in the required size, which means that the separating layers of the individual pieces of fabric have to be joined together when the oil barriers are being made. The particular challenge during production is therefore the manual assembly of the floating barriers, which makes the production process extremely laborious. On top of that, the units and presses have to work with extreme precision. “The oil barriers have extremely thin walls for their width – no more than 6–7mm. When they are shipped to the deployment site, they are coiled on strong winches. Every single kilogram counts and so the mass should be kept as low as possible,” added Möschen.